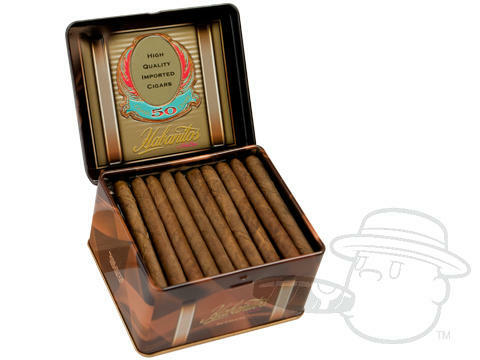 Don Lino Cigars are made by Miami Cigar, the makers of La Aurora and Tatiana. Don Lino cigars are available in three different lines: the Don Lino Dominican Series, Don Lino Africa and the Don Lino Habanitos. After fifteen years, the Don Lino Dominican cigar continues to shine through as a quality premium Dominican cigar, at a very inexpensive price. Best Cigar Prices offers these beautifully crafted cigars at nearly fifty dollars under MSRP. The Don Lino Dominican cigar has an extra-aged Connecticut wrapper, as well as Dominican binder and filler. Many smokers define the Don Lino Dominican cigar as being an enjoyable mild, and smooth smoke. The Don Lino Africa cigar was inspired by a trip that Miami Cigar’s founder, Nestor Miranda, took to the Serengeti Plains. After going on the safari trip of a lifetime, Miranda decided to create the newest Don Lino cigar in nine years. The Don Lino Africa cigar took almost two and a half years to create, and the result is well worth it. Being made in Nicaragua, the Don Lino Africa cigar contains tobacco from Africa, Nicaragua, Honduras and the Dominican Republic. The Don Lino Africa cigar endures a long aging process that ensures quality and allows for a substantial amount of flavor to exist within every puff of the cigar. This medium-full bodied cigar is unique, but will seem very familiar to any smoker who desires a deep, rich, full smoke. Best Cigar Prices also offers the Don Lino Africa Humidor, a beautifully crafted humidor that holds up to 120 cigars. The Don Lino Africa Humidor looks unlike any humidor that we’ve ever seen, as it is inlaid with an amazing scene from the African Savannah. The Don Lino Reserve Habanitos are a 3 x 22 cigarillo, and are offered in a box of fifty. These tiny delights are rolled using a Connecticut wrapper, as well as premium tobacco that is also used for cigars more than twice the price. The Don Lino Reserve Habanitos are machine made cigars, which allows them to be rolled to perfection every time. Miami Cigar also cellophaned each individual Habanito to ensure humidity, which is uncommon for a small cigar. Experience the brilliance of Miami Cigar at a bargain price!